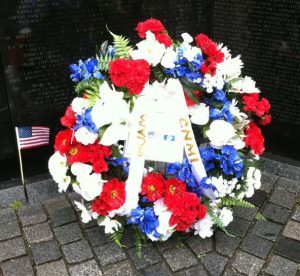 The “Chelu, We Remember You” Special Tribute was first recited at the first Chamorro Veterans Commemoration Ceremony, held in Washington, DC, on 24 March 2012. The special tribute was adapted from “Litany of Remembrance,” written by Rabbi Roland B. Gittelsohn (The Gates of Prayer, 1975), who adapted a poem by Rabbis Sylvan Kamens and Jack Riemer, written in the 1960s. In preparation for the historic Chamorro Veterans Commemoration Ceremony, NOCVA’s founding members adapted the “We Remember Them” litany to include phrases that would uniquely reflect the island heritage of the fallen Chamorro soldiers; a Chamorro translation was later added. Since then, the “Chelu Special Tribute” has been recited at funeral services of Chamorro veterans as a way to honor not only their military service, but also their island identity. NOCVA is committed to honoring Chamorro veterans by providing support for conducting “Chelu, We Remember You” Special Tributes as requested.